Project One invites you to remake Strunk and White's well-known The Elements of Style by recontextualizing selected composing principles in relation to a pop culture "text" of your choosing. Doing this well will require you to understand selected principles from The Elements of Style and to apply those principles to other samples of writing. 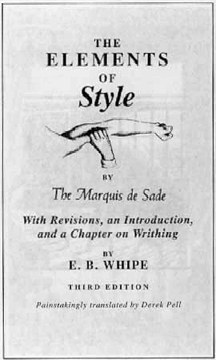 The project is inspired in part by Derek Pell's Marquis de Sade's Elements of Style, a small book that parodies Strunk and White by using de Sade's risqué writing to ridicule, comment upon, and in cases radically transform Strunk and White's handbook. To prepare for this assignment, we will read and discuss The Elements of Style, look at selections from Pell's work, and try it out with a few examples of our own in class. By way of this project, we are pursuing a richer sense of Strunk and White's maxims to contemplate just how adequate they are for a greatly expanded arena of contemporary language contexts, including those increasingly circulating online. By creating an encounter between Strunk and White and some pop culture "text" of your choosing, you will establish a framework for a critical examination of style. The points where Strunk and White and your pop culture text converge ought to be prime for parody, for play, and for up-close investigations of style. Your work will with each illustrative example restate or otherwise extend and implicitly critique principles established in The Elements of Style. You are urged here to produce a project that illustrates, as Richard Lanham puts it, the ways style can be "a pleasure, a grace, a joy, a delight" (28) and that therefore productively counters the style-in-a-vacuum problem created by many conventional style guides and handbooks. As you read The Elements of Style, you will notice that E.B. White describes William Strunk, Jr. in a variety of ways—as friendly and funny, as positive, as whimsical, as inflexible and choosy. We can almost imagine Strunk as someone who would be flattered by Pell's careful remake of the "little book." Keep this in mind as you proceed: you are welcome to involve as much or as little parody as you like. Yet, what works best about Pell's parody and what will work best about your own remake are those moments of sharp, critical contrast with Strunk and White's style. Your remake should follow the organizational lead of The Elements of Style. That is, you must adapt something from each of the five sections of the book, having sections that correspond to 1. Elementary Rules of Usage, II. Elementary Principles of Composition, III. A Few Matters of Form, IV. Words and Expressions Commonly Misused, and V. An Approach to Style. Many of your examples will come directly from your pop culture "text." But you are also allowed to modify them as needed. In other words, you might need to retro-fit the examples to align with some section from Strunk and White. You will also notice that Pell relies heavily on images. You are welcome to incorporate images, but you are under no obligation to do so. If you do so, please make choices with a sensitivity to the effectiveness and relevance of the images to your textual examples. The project should be a minimum of 1200 words. Typeface, line spacing, and the formatting of subheadings should be deliberate, but you have some flexibility in adapting these features of the document to fit with your aims. A full draft of the project is due on Thu., Jan. 26. Bring a paper copy to class on the 26th for peer response. The completed project is due on Tue., Jan. 29. Submit your work no later than the start of class on Jan. 29 by uploading it to the Dropbox available in EMU Online. Include an appropriate title for your project (see below). Your remake will begin with a scene-establishing introduction. That is, you will write an introductory section that establishes a context for the remake. You can setup the remake by establishing a situation as absurd or as realistic as you wish. In either case, the writing should be carefully done and it should function as a segue into the rules and examples further along in the project. Your rules and examples will, in some cases, match up nicely with Strunk and White's and at other times, they will break from convention and, often, parody Strunk and White. You will get a better feel for this as you read The Elements of Style and as you look at examples produced by former ENGL328 students. As you proceed, remember that almost every principle and example will require an explanatory note, something like a gloss or footnote that discusses what the principle and example help us understand about style as it is situated in time, place, genre, and social context. Develop a clever, memorable title that explicitly establishes the tie between your pop culture text and The Elements of Style. Notice that the title page of Pell's book (above right) positions Pell as a translator, and includes other parodic asides. Several examples produced by previous ENGL328 students are available for you to read in Issue 1, Volume 1 of EM-Journal.